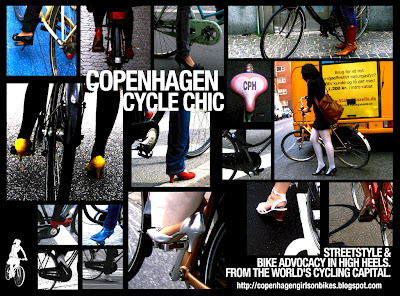 Cycle Chic®: The Amazing Cyclist Fashionistas of Copenhagen! The Amazing Cyclist Fashionistas of Copenhagen! It's a big world. A world of similarities but also a world of differences. It amazes us that while wandering about in the blogosphere we stumble upon so many comments on message boards and articles in newspapers that express amazement at how women can ride in heels. Making it sound like it is as strange as showing up at a bowling alley in full cricket gear. As you can see from our little screensaver above [feel free to click on it and download it your computer, if you like] , it's a daily part of life here in Copenhagen. There is suprisingly little on the subject on the net. With the help of some of our female readers, we have gathered a few links regarding chic biking - 'how to' and 'you can, too' kind of pieces. 3. Glamour.com has a bit about riding in heels in Paris from a fashionista. "...biking in heels just makes balancing at intersections easier—as if she were wearing fetching stilts or kickstands." 2. The good people at the San Francisco Bike Coalition has a great piece called "Diva's Guide to Biking". It's a bit of a plain description for the uninitiated but as she writes, "I hope these small words of advice and encouragement help all you divas out there find your inner cyclists, and help all you cyclists find your inner divas. Be glam, ride safe, and enjoy the city!" A lovely little article. 1. We wandered headfirst into this article about Cycling in Skirts, by Pauline Harder on Happy Woman Magazine without being totally prepared. It's a satirical website, sure, and it all seemed energetic and inspirational enough: "To get the most out of cycling in skirts you must cycle with a sense of whimsy." Indeed. Fair enough. But then Ms Harder starts discussing skirt length - "the shorter the better is the rule" and, oh goodness us, Undergarments... "While undergarment exposure for a skilled skirted cyclist is minimal, it is imperative that these fleeting glimpses be pleasant for onlookers, and a source of pride for yourself." It's a great article. Amusing, constructive and inspirational for female cyclists everywhere. It deserves a read. "Cycling in skirts raises cycling from a mere sport, to an art form; an art form with you as both subject and creator, and the world as your canvas." Well said. Satirical or otherwise. Pauline Harder is hereby presented with honourary Copenhagen Cycle Chic citizenship for her dedication to the cause. Two questions to our readers. Does anyone know of other inspirational sites/articles like the ones above? Send them along. For the benefit of our female readers. Thanks, Marilyn! Great to hear it. and great to hear you're spreading the word! I've been referring people to your blog as I work as a cycling development worker in Wolverhampton UK. The amount of times I hear drivel that you have to wear helmets and flourescents to cycle, so your site is living proof that people don't and that you don't have to dress like an alien just because you get on a bike! Also popped up a mention on the front page of 'bentrideronline. Alas I've not any pics of chic on a recumbent. don't see many recumbents over here, i must admit. on occasion. I love your screensavers and I would appreciate to see more of your fantastic works :-) really great!! !